Note the officer in the kilt in the centre - someone must be able to identify him. 2/Lt Bruce, R., 15th HLI. Winterbottam was later in No 5 Bn of Special Brigade. Perhaps Terry and uniform experts can say which is shown in the photo? Just as a point of interest, not all officers who volunteered for the SB became RE officers. Permanent transfer to the Corps was optional and quite a few preferred to stay with their original regiment or corps. PS: Just realised, the HLI wore trews so this is possibly the other officer mentioned. Back to the drawing board. The Winterbottom family were quite 'well-to-do'. I've just found out that " In 1899 Mr. George H. Winterbottom, of Manchester, purchased the manor and estate and resided at Horton House until his death in 1935. The property was then sold to Mr. W. Storey, of Portsmouth, who resold most of the estate in small lots"
Wonder if you have any mention in your files of Corporal 106284 Otto Behrendt. He was later commisioned and served as a Captain in the Royal Engineers, winning an MC. I have his citation but what really interests me is any detail on his early career in the Special Companies. He was present at the attack on the Hohenzollern Redoubt on 13th Oct 1915 with the 46th Division, and just wondered if you were able to identify which one of the 4 original Special Companies he was a member of. Could I ask what your interest in him is please? If you wish to keep it confidential, please PM me. Thank you. Reason for my interest is mainly due to my research into the attack by the 1/5th Lincs at the Hohenzollern Redoubt on 13th Oct 1915. In one account of the battle a Scunthorpe soldier in the 1/5th mentions seeing another Scunthorpe lad from the engineers at the redoudt giving his name as Otto Behrendt, son of a local surgeon. Not sure when the Cornwall address takes effect but on a 1917 publication in Scunthorpe Otto is recorded as living at 175 High Street, Scunthorpe. For interest he had three brothers, Carl, Oscar and Rupert. Rupert sadly died of wounds on 16/7/16 whilst with the 24th Royal Fusiliers. Carl served as a Private with the Middlesex. Their father was born in Prussia. He served as a Sergeant in 15 section, 187 Company at Loos. I have a lot more information about him if you require it. My Dad Christopher Grieves 214395 served in the Special Brigade (After serving in the Northumberland Fusiliers and KOYLI) and I think it was Terry who told me he was in P Coy 4th Battalion. A Birth Certificate for one of my elder brothers states that Dad was in 74th Section. I don't have any photos of my Dad so I have peered into the faces of your photos with anticipation that I might recognise my Dad but it is a forlorn hope. Nevertheless, It has been great to see the photos and read your posts. If I was living in UK I'd be haunting the National Archives looking for more info, but that is a bit difficult as I live in Australia. I made a great discovery last year on Ancestry.com, my Grandfather William John Grieves 102472 joined the RE in 1915 aged 46 and was a Tunneller in the 170th Tunnelling Company. Thank you every so much. Exactly the specific piece of information i was hoping for. If i do find any more info on him i will pass it on to you. Thanks for the offer of further information. Post war address: "Glenderry", Mansfield Road, Derby. 22.04.16 - transferrd to RE: No 1 Special Company, 5th Battalion. 04.09.16 - to England, sick. William Harold Elliker was born on 25 June 1889 in Uttoxeter and was the oldest child of Walter a music teacher and future vicar, and his wife Ada. In 1901, Mary and her children were living with her mother in Uttoxeter. Elliker was employed as a bank clerk prior to the Great War but enlisted into the 21st (Public Schools) Battalion of the Royal Fusiliers on 15 September 1914 in Derby. He obviously took to soldiering well as he was promoted to CSM of No 2 Coy less than 6 weeks later on 24 October before being commissioned on 1 January 1915. The battalion proceeded to France on 14 November but was disbanded in April 1916. Elliker transferred to the Special Brigade. On 24 February 1917, William Elliker married Constance Symonds the daughter of the Rev William Symonds in Derby. Later in 1917, Elliker returned to England suffering with Trench Fever and Shell-shock and he remained on home service for the remainder of the war. In his final post he was in charge of a company of the Special Brigade at Devonport. In the early part of 1918 Constance gave birth to their son also called William but nicknamed Ralphie. Elliker was promoted to captain in Jan 1919 but sadly contracted a fatal bought of influenza and died at Devonport military hospital on 19 February 1919. Congratulations on an astonishing job, Terry! As a newcomer to family history research (and a total duffer in military matters) I'd greatly appreciate some help in piecing together details of my grandfather, who died in the Great War and whose embroidered cards home -- four to my grandmother and a birthday card to his eldest son, my father -- are among my treasured possessions. I can offer this in exchange, for your database: his name was John Arthur Morris; he was born in Clerkenwell, London, in 1882; later lived in Walthamstow; worked as a briar pipe polisher; and served as a Pioneer with D Special Coy (Service No. 206743), which I understand means he was involved in gas operations. He died on 10/08/1918 (taken from the CWGC site – I take it that's 10 Aug and not Oct 8), leaving a widow and six children between the ages of four and 12. He is buried in an extension to Montigny Communal Cemetery. My wife and I went there three years ago. It was an emotional experience, not only because we were, I believe, the first family members to visit his grave. He lies between two Germans, a comforting reminder that we're all one in death. Yet yards away is the proof that some hostility never dies, a solitary grave housing a British deserter – for ever marked as a man apart. I wrote to the RE Museum asking for details of granddad's army service and, I hoped, of his death. They replied that, due to the nature of the Special Companies' operations, no details exist of their areas of action or the work undertaken; also that no diaries were kept. Such information as I have, therefore, comes from the CWGC and Ancestry's Great War Dead site, which states that he was "formerly 23331, Rifle Brigade", and which puzzlingly (to me) lists his theatre of war as Aldershot. Your site, with its intensely personal character, may therefore be my best hope. Can anyone offer any guidance to the action in which my grandfather may have been killed; the circumstances of his death; in fact, anything which may shed some light on him? There are also other ways of finding out what operations were carried and when. If the war diary draws a blank, which is unlikely as operations were always recorded, then come back to me. It may be that your grandfather may not have been recorded by name however. Thanks for the information. I will do some rooting around and see if I can turn anything up. Thanks a lot, Terry. Will do. No it wasn't. There may have been some units that took photographs on their own initiative and of course individuals as well, but it was not done as a matter of course. Your best bet is his home town local newspaper. My grandfather Reginald John Beard served in the RE Special Brigades , Stokes 4" trench mortar- he enlisted in Pontypool in early 1918 after being recruited in Sheffield where he worked as a trainee analytical steel chemist - his best frd Harry Johnston also joined (he was a footballer - Dheffield Utd , played for England after the war and managed Mansfield Town). They were 'sold' the idea of the RE as an extension of their career (yeh right!). Both men survived , my grandfather dies in NZ in 1995 aged 96yrs..he only spoke of his time in the RE when 80+- I have a couple of ophoto's one in France in front of a Stokes trench mortar and one when he was passing out of basic trauin ing with the rest of the (Platoon?). He did tell me a number of tales about his time in the trenches and happy to share those if there is any interest. My relative was 169506 Lance Corporal Henry Stirling Watson, N Special Coy REs. Born at 8 Freeland Place, Kirkintilloch 28 April 1898 he attended Lenzie Academy where he came 13th in the Glasgow University Entrance Bursary Exam. He was in his 2nd year (I think) at Glasgow Uni (studying French and Chemistry) when he joined up (volunteered I believe) as a Pioneer. He came home on leave in 1917 and I have a poignant family photo with his parents, 3 sisters, younger brother and elder brother who was in the HLI and coincidentally on leave also. 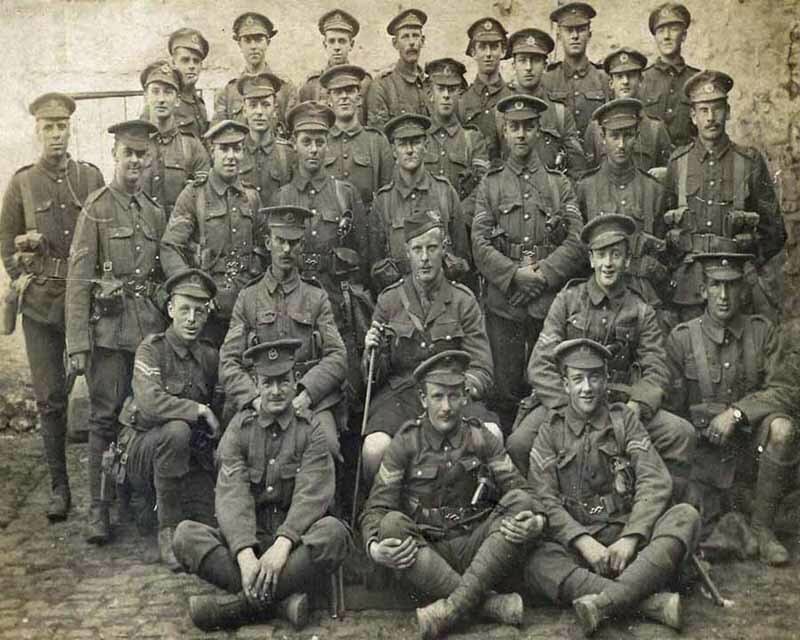 Within weeks of the photo Harry was back in Belgium and met his end when a shell burst behind the lines (so the family legend has it) taking Harry and several of his mates. He lies at Belgian Military Cemetery, Steenkerke, Belgium, Grave B8. Alongside are 2 other REs who died same day (14 Nov 1917) and a third who died on the 15th. The war diary gives no details of his demise other than referring to him as one of "2 dead OR". He is commemorated on the war memorials of Lenzie Academy, Glasgow University (also on their on line roll of honour), Kirkintilloch War Memorial and on a plaque in the Clydesdale bank premises in Cowgate, Kirkintilloch on the site of the YMCA building. Harry was a member. His death was marked by a poem in the local paper by R G Rodger. I am struggling to find info as to which battles N Company was involved in (not helped by my inability to understand armies, Brigades, Corps, Divisions etc! ), and in preparation for a long overdue visit to pay homage would like to learn whether he was at Chatham for his training or elsewhere, where he arrived in Europe and where he saw action/was billetted. His identity disc and his cigarette case with self rolled ciggies still intact survived and were sent home to his family. Holding them is one of the most powerful emotional experiences of my life. In 1920 he was awarded the Belgian Croix de Guerre, (posthumously)though again we are in the dark as to the nature of the action for which he was so decorated. I believe you are the RE man and accordingly very heavily in demand. I hope the above adds something new to your database of Special Co men and any info you can share would be greatly appreciated. I have posted elsewhere re info on his fellow casualties of 14/15 Nov 1917, again to fill out a picture of who they were, in the hope that descendants may be able to shed more light on how they died.